Immunization is a highly cost-effective way of improving child survival, yet immunization rates remain low in many developing countries. In rural Rajasthan, India, researchers evaluated whether improving access to vaccines via immunization camps could increase immunization rates, and whether additionally offering a non-financial incentive such as lentils could further increase rates. They found that providing incentives alongside reliable immunization camps increased the likelihood of full childhood immunization by more than six times, whereas households not offered incentives were only 2.7 times more likely to immunize their children. The addition of the incentives also made the program more cost-effective because immunization facilities were more fully utilized. Immunization is a highly cost-effective way of improving child survival, however, every year an estimated 2 to 3 million people die from vaccine-preventable diseases. High absenteeism rates among healthcare providers and unreliable supplies of vaccines may contribute to low vaccination rates in many developing countries. A lack of understanding of the benefits of vaccination or even a suspicion of government health services have been raised as possible contributing factors. Conditional cash transfers have been found to be effective in raising immunization rates, but these programs are very expensive and have mainly been tested in areas where health services are relatively well functioning. Can relatively small incentives have a big impact on immunization rates or when immunization rates are very low is the hostility too deeply rooted to be impacted by a small incentives? How much of the problem is just unreliable supply? In India, immunization services are offered free in public health facilities, but the immunization rate remains low. According to the National Family Health survey, only 44 percent of children aged 1-2 years old have received the basic package of immunizations. That rate drops to 22 percent in rural Rajasthan, and the data are likely to overstate immunization rates. 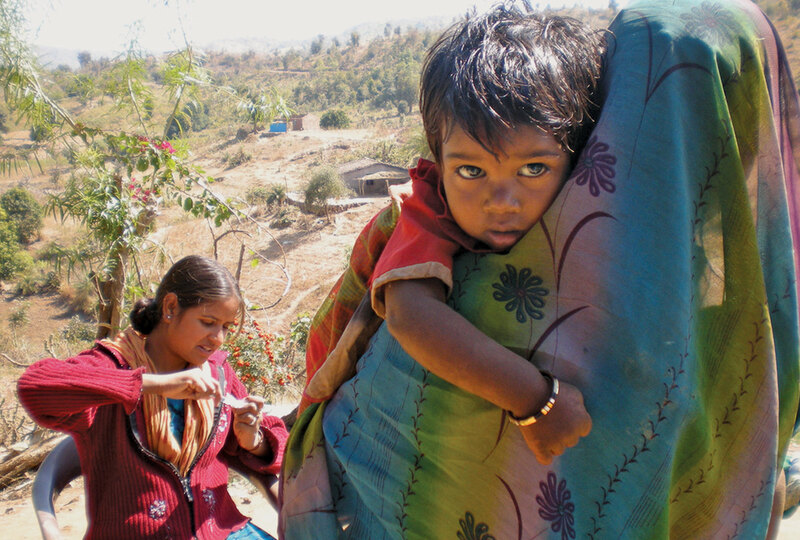 Careful probing found only 2 percent of children had received the full package of immunizations in mostly tribal villages in rural Udaipur district. The public facilities serving these areas are characterized by high absenteeism: 45 percent of health staff who carry out immunizations (Auxiliary Nurse Midwives, or ANMs) are absent from their village-level health center (and could not be found anywhere in the village) on any given workday, with no predictable pattern to their absences. Given that a full immunization course requires at least five visits to a public health facility, the unreliability of the ANMs increases the opportunity cost of a visit to the sub-center and may deter families from taking their children to complete their full immunization schedule. 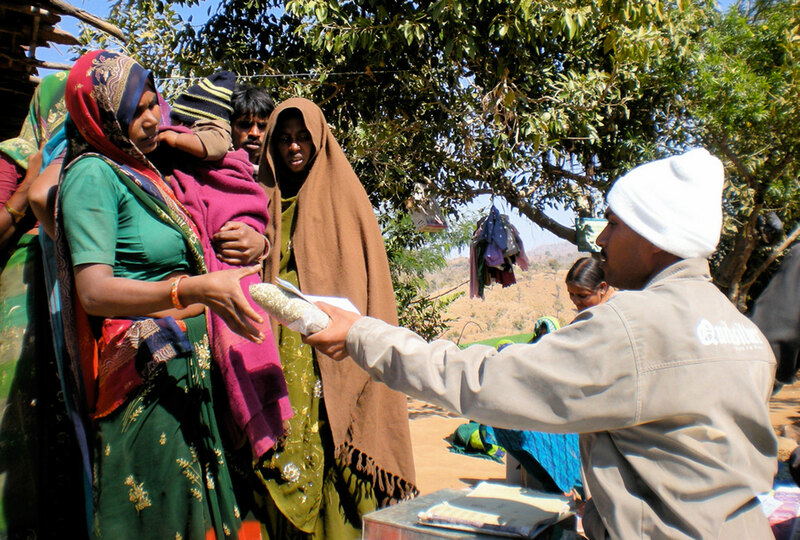 A parent receives a kilogram of lentils at a vaccination clinic in Rajasthan, India. This study assesses the relative efficacy and cost-effectiveness of improving the supply of infrastructure for immunization, and improving supply and simultaneously increasing demand through the use of modest, non-cash incentives. Two interventions were evaluated in rural Udaipur, and a third set of randomly selected villages served as the comparison group. Intervention A: Seva Mandir (a local NGO) hired a mobile immunization team including an ANM and assistant to conduct monthly immunization camps in villages. The camps were held from 11am - 2pm on a fixed date of the month and the presence of the ANM was verified by timed and dated photographs of them in the villages, as well as regular monitoring. Records indicate that 95 percent of planned camps took place, and were not disrupted by provider absence. A Seva Mandir social worker who lived in each village informed mothers of immunization camp availability and educated them on the benefits of immunization. The vaccine package administered was the WHO/UNICEF Extended Package of Immunization (EPI), which is the package provided by the Indian government. At the first immunization, every child was given an official immunization card indicating name, parent' s name, and the date and type of each immunization performed. When a child arrived at a camp without an immunization card and it could not be ascertained whether they had received a given immunization, he or she was immunized. Intervention B: Using the same immunization camp infrastructure as intervention A, intervention B also offered parents 1 kg of lentils per immunization administered, and a set of thalis (metal meal plates) upon completion of a child' s full immunization course. The value of the lentils was about Rs. 40 (less than one dollar), equivalent to three quarters of one day' s wage. The incentives were provided as an agent to help offset the opportunity cost of taking a child to be vaccinated. Compliance with the full course of immunizations was verified by the child' s health card. Incidence of full immunization (child received 5+ vaccinations): Among children aged 1-3 years, 38.3 percent were fully immunized in intervention B villages, compared to 16.6 percent in intervention A villages, and 6.2 percent in comparison villages. A child was 6.19 times as likely to be completely immunized in intervention B villages as in comparison villages, and 2.69 times as likely to be immunized in intervention A villages relative to comparison villages. Children in areas neighboring intervention B villages are also more likely to be fully immunized relative to those in areas adjacent to intervention A villages (20 percent vs. 10 percent), suggesting that reliable camps with incentives also prompted parents from farther away to get their children immunized. Study results indicate that offering families in resource-poor settings small, non-financial incentives in addition to reliable services and education is more effective than providing services and education alone. It is also more cost effective, lowering the cost per child immunized, even considering the cost of the incentives. The average cost per child completely vaccinated was $27.94 in intervention B villages, relative to $55.83 in intervention A villages. Banerjee, Abhijit, Angus Deaton, and Esther Duflo. 2004. "Health Care Delivery in Rural Rajasthan." Economic and Political Weekly: 944-99. Banerjee, Abhijit Vinayak, Esther Duflo, Rachel Glennerster, and Dhruva Kothari. 2010. "Improving Immunisation Coverage in Rural India: Clustered Randomised Controlled Evaluation of Immunisation Campaigns with and without Incentives." BMJ 340-222.